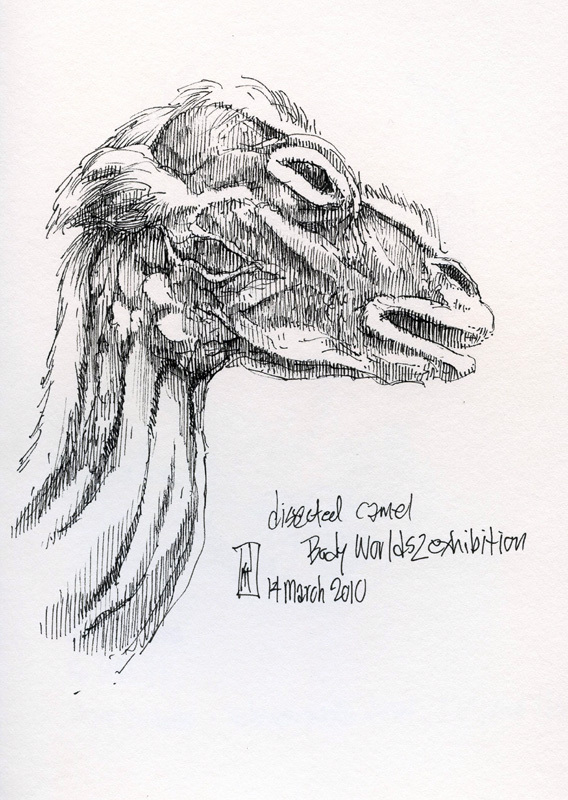 On 14 March 2010, I spent an afternoon drawing at the Body Worlds 2 exhibition at The Franklin Institute in Philadelphia. Body Worlds is the pet project of Dr. Gunther von Hagens, the controversial anatomist who developed and patented a method for preserving anatomical specimens via plastination in the 1970s. The first Body Worlds exhibition — featuring full-sized dissected human bodies in unusual poses — was mounted in Japan in 1995. Since then, Body Worlds has been touring the world in one incarnation or another (this was second Body Worlds exhibition at the Franklin Institute within five years), and often stirring controversy in its wake. Religious groups often object to the exhibitions as disrespectful of human remains, whereas the medical and legal community has questioned the means by which von Hagens acquires bodies. This drawing shows a profile view of the dissected head of a juvenile camel. I'm not exactly certain why this piece was included in the exhibition as there wasn't much of an attempt to discuss comparative anatomy. However, I was attracted to it, and so spent a couple of minutes sketching it out. While I was drawing (an activity which itself attracts unwanted attention), a child asked his mother if the camel was standing on real sand.